I've already professed my love for Pure Barre. From day one (late last September), I knew it would be my new fitness love. It's low-impact, so even though you're working really hard, it doesn't seem like you are. This also means it's not a sweat fest - you'll often see ladies changing clothes after class and heading to work (or keeping their leggings on and just going about their day). Pure Barre Platform, however, is an entirely different beast. Late last year, the Pure Barre franchise announced they would be adding a cardio class to the traditional Pure Barre ones, named Pure Barre Platform. Not all studios offer it yet, but it rolled out here in Huntsville last month (with preview classes beginning in January). Platform follows the same basic structure of a regular PB class, but everything is amped up. You're jumping, you're "flying" - all the while tapping and stepping off your platform. Just for comparison, regular PB classes should burn around 400 calories, Platform classes burn double that. After one Platform class, I literally heard two different gals comment that they had thought they were going to puke during class. And I'm 99% certain everyone thinks they are going to pass out at one point or another. Even so, I've already been to ten of these classes, because they are that awesome. Think 80's aerobics party. I mean, need I say more? 1. Eat a little something beforehand. Going in with an empty tank won't get you far. This class is booty-kicking hard. If I'm going first thing in the morning, a banana or Lara-Bar will do the trick. It's not hot yoga, but you will sweat. A lot. So drink up beforehand. 3. Dress in leggings and a supportive top (and don't forget your sticky socks). Just like regular barre, they ask that your legs and feet are covered, but you won't want anything too bulky so leggings are ideal. Unlike regular barre, you'll be jumping and kicking, so I prefer a top with some support. 4. Make sure your clothing is made of moisture-wicking fabric! Anything made of cotton will make you look like a perspiration massacre by the end of class. It's not pretty. Choose a fabric that hides the mess. You'll want it to wipe your face and neck, but also it's handy to use as padding on the platform when you're gripping it with your hands for some of the floor moves. I bring my hot yoga hand towel and it works perfectly. For regular barre, I like a skinny band just to keep my hair out of my face. These ones are perfect - they have a velvet back which keeps them in place the whole time. But for platform, I like something thick that can wick away perspirations (something like this, this or this). 7. Take a full water bottle or tumbler. You'll want water during class. Trust me. But, there are no breaks so any sips of water need to be done quickly. I like to bring a reusable tumbler with a straw so I don't have to mess with taking a water bottle cap on and off and losing precious class time. 8. Arrive early to select your spot. For platform, everyone has their own space (and platform) directly in front of the barre. The best spots (in my opinion) are along the front flanking the instructor. They give you the best view of what's going on because you can glance in your periphery as she demonstrates. Any spots on the sides or in the back of the room make it way more confusing (at least for me) to follow along because all the moves are mirrored. Choose a platform and claim your space by putting your items in front of it (for class everything goes in front since you step off the back). You'll also need a light set of weights. Lots of times these are placed on the top of the platform until class starts to show that the platform spot is taken. 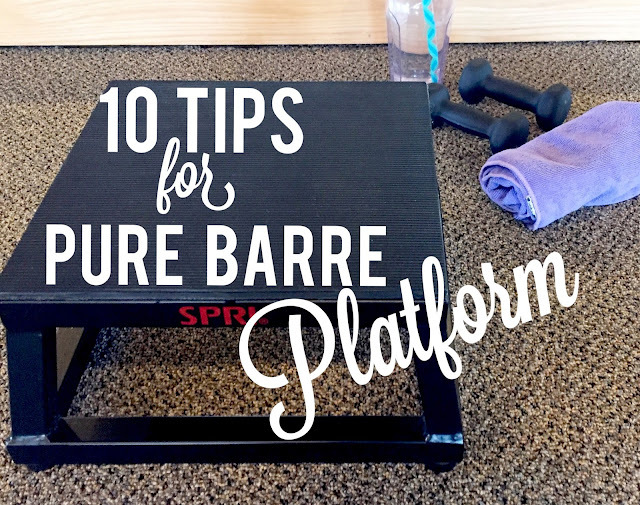 If you thought Pure Barre was fast, Platform is Pure Barre on uppers with a double espresso. It's crazy fast and the only way to make it through is to pay attention to every single word the instructor utters, the entire time. She'll say everything you need to do and how to do it. Because it's so fast paced, however, it's easy to miss things so look for any instructors who are attending class. They should have perfect form, and will be good examples of whatever movement is going on. Listen to the music as well. Like PB, Platorm is music based and driven, so all your moves will be with the beat. And cut yourself some slack. This class is difficult. No one is doing every single "double-time" at 100%. But give it your all, push through, and I guarantee you will feel fabulous afterwards. Good luck and happy Platforming! Click here for 5 Reasons to attend 5AM Pure Barre! I've been doing barre for a little over a year and a half and love it! I go to a local studio...wonder if they'll try anything with the platform! I love this weeks top 10 for you, and I really wish they had a class like PureBaree around here in my small town! Sounds like a great workout! This sounds like a work out! Great tips for those thinking of trying this. From the 10 on Tuesday link up. I love Platform until my platform flipped when I was doing planks yesterday - ouch! I agree, it's brutal, but you feel such a sense of accomplishment when you are done! I'm going again tomorrow! Omg, don't worry, the same thing happened to the gal on my left during my last class! I've never done any barre type of workout, but hear great things about it.